Robin—established as a combined “Uber for lawn maintenance” and robotic lawn mowing company in Texas—is expanding its robotic service nationwide via a franchising program, Techcrunch reports. The company has since rebranded as Robin Autopilot and is now looking for partners. According to Robin’s website, co-founders Justin Crandall and Bart Lomont decided to go all in on Robin’s robotic segment in June after becoming frustrated by the everyday obstacles of running a lawn mowing business, as well as concerned about their own carbon footprint. 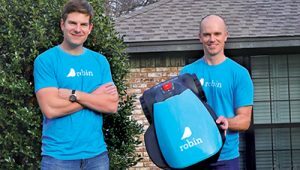 They sold Robin’s mowing-on-demand segment to Porch, Techcrunch reports, and held on to the local robotic lawn care business, with hopes that the franchisees will provide cash flow for the main company. Now, in addition to providing robotic lawn services to individual homeowners, Robin also will lease the bots to Robin franchisees, who will take over the local legwork. While it might cost more than $100,000 for a company to go it alone in the robo-mowing business, Robin says it will cover much of those costs. In terms of 2018 plans, Robin says it hopes to secure up to 20 franchisees. The company intends to start in the Southern U.S., with California as a long-term goal, and it’s aiming to target veterans; Lomont is a former member of the Air Force. The co-founders of the company also made an appearance on Shark Tank on Nov. 12, 2017, seeking $500,000 for five percent equity, Business 2 Community reports. They failed to get a deal from any of the five judges. 2 Comments on "Robin launches robotic mower franchise program"
How do these mowers work? Do they cut in various heights? What are the advantages of a regular mowers? What are the cutting width? Do the mowers trim hedges, weedeat a line, and pull weeds too?